Fresco in S. Maria del Sasso in Lombardy, shamelessly pinched from here. The message that comes from the Holy Family is above all a message of faith. In the family life of Mary and Joseph, God is truly at the center, and it is in the person of Jesus. This is why the Family of Nazareth is holy. Why? Because it is centered on Jesus! When parents and children breathe together this climate of faith, they possess an energy that allows them to confront difficult trials, as shown by the experience of the Holy Family, for example, during the tragic event of the flight into Egypt: A hard trial. 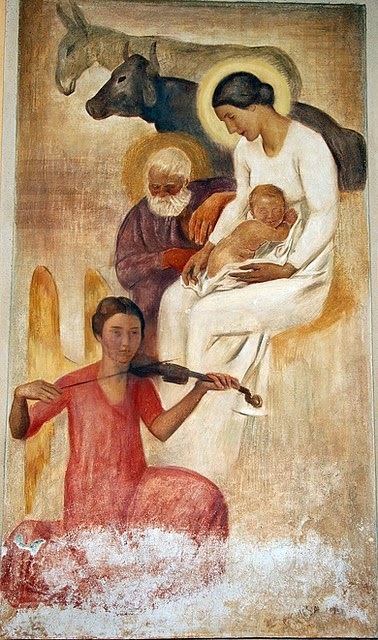 The Child Jesus with his Mother Mary and with Saint Joseph are the icon of the family, simple yet illuminating. The light they radiate is a light of mercy and salvation for the whole world, a light of truth for every man, for the human family and for individual families.